Have you collected enough emails to send out an email newsletter? 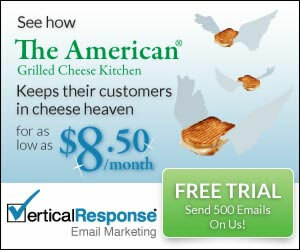 You’ll need a company like Vertical Reponse to help you send those emails out. Don’t reply on free services as they don’t have the benefits that VerticalReponse has. Sending out email incorrectly can get your site marked as SPAM and can get you in trouble if not sent correctly. VerticalResponse knows the proper way to send out your emails. You’ve spent a lot of time and effort in getting these emails so make sure you get the maximum return on them. Try VerticalResponse for FREE right now. You’ll get to send out 500 emails to test out their services.